Pickup trucks are more capable and better for daily driving than ever before. We'd put our money on these features if we had to bet on why car shoppers are flocking to pickup trucks as their everyday vehicle. Since pickups are used for everything from towing and hauling, to daily commutes and family road trips, the safety ratings of contenders in this segment are crucial for making the right choice at the dealership. We looked at the 2018 data provided by the IIHS (Insurance Institute for Highway Safety) after they crash tested vehicles in every segment to present the top 3 safest pickup trucks on the market this year. Each year, the IIHS evaluates vehicles for safety in two areas: Crashworthiness and Crash Avoidance and Mitigation. Crashworthiness is measured by 6 crash tests including driver-side small overlap front, passenger-side small overlap front, moderate overlap front, side, roof strength, and head restraints. There are four grades that can be issued for each test including 'Good', 'Acceptable', 'Marginal' or 'Poor'. The Crash Avoidance and Mitigation category rates vehicles with available front crash prevention systems as 'Basic', 'Advanced' or 'Superior', based on the type of system they have and performance in track tests. Vehicle headlights are also evaluated based on visibility on curves and straightaways and scored with the same grade system as crash tests. To score a Top Safety Pick award, a vehicle must get 'good' ratings on driver-side small overlap front, moderate overlap front, side, roof strength, and head restraint tests. It must get an advanced or superior rating for front crash prevention and an 'acceptable' or 'good' headlight rating. While there are many safe trucks you can buy, only one earns the Top Safety Pick rating in 2018. The Honda Ridgeline stands apart from the rest of the pickup truck segment thanks to its unibody construction, car-like driving feel, and the fact that it is the only pickup to earn an IIHS Top Safety Pick rating in 2018. The Ridgeline is not as rugged as some of its competitors, but that's by design. Honda carefully looked at the customer base of light-duty trucks and found that a large number of customers are looking for an everyday vehicle that can handle towing a boat or hauling some gardening supplies on the weekends. 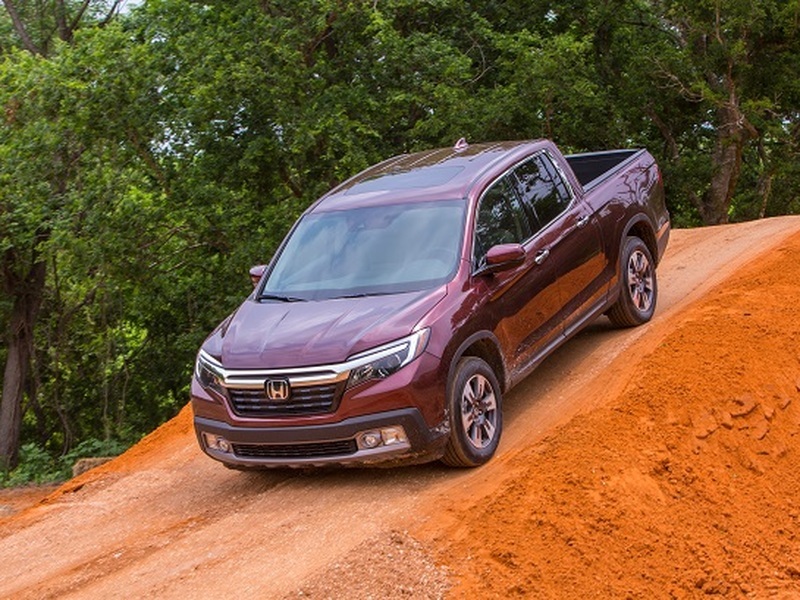 When designing the new Ridgeline, Honda kept this customer in mind to create a truck that offers a smooth ride, can fit the family comfortably and can tow up to 5,000 lbs. Truck shoppers often obsess about a truck's towing capacity, but it's important to remember that keeping your speedboat away from harm isn't your pickup truck's sole job. When you buy a vehicle for the everyday commute and to haul precious cargo, you need to be sure you're choosing the safest option. Based on 2018 IIHS ratings, Honda Ridgeline buyers can rest assured they're getting a truck that has their back in the safety department. The Ridgeline gets top 'Good' ratings for all crashworthiness categories besides one since it was not tested for small overlap front passenger-side. The Ridgeline also dominates the crash avoidance and mitigation category and is the only pickup truck to earn a 'Good' headlight rating. Second on the IIHS list for safest pickup trucks is the 2019 Ram 1500. Although it just missed a top safety pick rating due to a 'Marginal' score for headlights, it is still a capable, spacious and safe truck to buy this year. For the 2019 model year, the Ram gets an updated suspension resulting in a smoother ride, a capable HEMI V8 and better steering. The infotainment options are excellent along with the interior materials and the comfort of the front seats. Along with being rugged and great to drive, the Ram 1500 is also a safe choice in the pickup segment. The IIHS awards the Ram 1500 "Good" scores across the board for crashworthiness and a 'Superior' rating for front crash prevention in the crash avoidance and mitigation category. The only safety drawback for the Ram 1500 is the performance of the vehicle's headlights. The headlights provide sufficient visibility on straightaways but fall short on curves. The 2018 Ford F-150 landed third on the IIHS list for the safest pickup trucks and it has plenty to offer from a capability standpoint with a new transmission and a more powerful engine for 2018. Go with the F-150, and you'll get a comfortable ride, a spacious cabin, and 395 horsepower from the new 5.0-liter V8. The F-150 is a true workhorse with a towing capacity between 5,000 and 13,200 lbs based on configuration. Despite missing the Top Safety Pick award in 2018, the overall IIHS safety ratings for the F-150 are reassuring. In the crashworthiness categories, the F-150 gets 'Good' scores on all tests other than 'passenger-side small overlap front' for which it wasn't rated. For crash avoidance and mitigation, the F-150 scores a 'Superior' rating for front crash prevention and only falls short for headlights that provide inadequate visibility on both straightaways and curves.